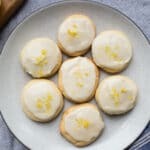 Easy Lemon Butter Cookies with a deliciously tart lemon glaze. Gluten-free, grain-free, and refined sugar-free. Preheat oven to 350 degrees Fahrenheit. Line a large baking sheet with parchment paper. Set aside. In the bowl of a food processor (or large bowl), add the butter, cane sugar, honey, egg, and vanilla. Pulse for about 20 seconds or mix with electric mixer. Add lemon zest and lemon juice and pulse for another 10 seconds. Add almond flour, coconut flour, salt, and baking soda and process until a dough forms. Allow dough to sit for about 5 minutes. Use a tablespoon to scoop dough. Roll into a ball with your hands and place on cookie sheet. Spray your hand or bottom of a glass with cooking spray and flatten dough balls. Bake for 8-10 minutes. Remove from oven and transfer cookies to a wire rack to cool completely. While your cookies are cooling, make your lemon glaze. In a small bowl, whisk the powdered sugar, melted butter, and lemon juice until a glaze forms. If too liquidy, add a little more powdered sugar. Frost cooled cookies with glaze and sprinkle with lemon zest. *You can make your own powdered sugar by blitzing organic cane sugar in a high speed blender. Adapted from Ambitious Kitchen and Food and Wine.